Hydrolyzed collagen protein is the most bio-identical protein source on the market. Boasting a remarkable 95% absorption rate, Nufínna delivers superior weight loss and post-workout recovery results. Key Ingredients: - What powers Nufínna? Bring focus to your life with the natural smoothie that delivers 12 grams of hydrolyzed collagen for unparalleled daily protein nutrition. Hydrolyzed collagen protein is the most bio-identical protein source on the market, delivering superior weight loss and post-workout recovery results. and is free of artificial colors and sweeteners. and be balanced and productive. Optimal protein utilization - Protein is an essential building block of life. 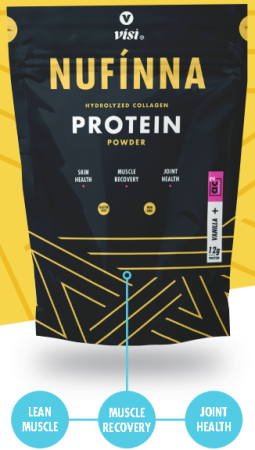 Because it is naturally occurring in the body, hydrolyzed collagen protein has a 95% absorption rate, allowing fast and effective delivery of protein to where it is needed most. Supports joint flexibility - Hydrolyzed collagen protein is essential in creating connective tissue, which improves mobility in the joints. Satisfies hunger - With 12 grams of protein and two grams of fiber, this delicious smoothie helps curb cravings and leave you feeling full. Naturally nutritious snack - Nufínna’s whole fruit and vegetable blend provides naturally occurring vitamins, minerals, and phytonutrients free of artificial colors and sweeteners. Hydrolyzed Collagen Protein—Vísi’s hydrolyzed collagen protein is the most absorbable and easiest to digest of any protein. Nufínna’s collagen is hydrolyzed via a patented process that uses natural fruit enzymes—rather than unnatural acid hydrolysis like many protein products use—to extract collagen protein without using heat, synthetic chemicals, or acids, just like nature intended. This guarantees the integrity of the finished molecules through a six-hour filtration, sterilization, and drying process. The care taken ensures the finest quality protein on the market, with a 95% absorption rate that the body can utilize better than any other protein source available. Arctic Cloudberry—The rare arctic cloudberry is ripened under the phenomenon of the Midnight Sun in Scandinavia. Completely natural, distinctly flavorful, and highly prized for its nutritional value, the arctic cloudberry boasts high levels of vitamins A, C, E, and B as well as calcium and magnesium and also contains ellagitannins and ellagic acid. The Scandinavian people have depended on the arctic cloudberry (also known as Scandinavian Gold) for centuries to promote health and natural beauty. Fruit Blend (Apricot Fruit Powder, Strawberry Fruit Powder, Red Raspberry Leaf Powder, Blueberry Fruit Powder)—Nufínna contains a specially crafted blend of fruits to improve your healthy lifestyle. Apricots contain beta-carotene which promotes a healthy heart and eyes. Strawberries contain Vitamin C and Manganese which protect the heart. Blueberries contain anthocyanins, known to protect the brain and improve memory. Blueberries also protect the heart, maintain blood sugar levels, support eye health, and provide antioxidant support. Vegetable Blend (Broccoli Extract, Alfalfa Leaf Powder, Spinach Powder, Kale Powder, Spirulina Powder, Atlantic Kelp Powder)—These powerful greens keep your systems functioning at their peak. Dark green leafy vegetables are rich in chlorophyll which alkalinizes the blood. Kale and broccoli are cruciferous leafy greens which boast high nutrient and glucosinolate content. Also abundant in these greens are magnesium and tryptophan, known to enhance heart health and brain function. Spinach and chard are both rich in iron, which carries oxygen to the blood for the best performance of your vital organs. More efficient absorption is only one of the advantages of Hydrolyzed Collagen Protein. Collagen is the most abundant protein in the human body and it promotes lean muscle mass, weight loss, skin toning, arterial strengthening, increased energy and helps with joint support. * Collagen is the main protein of connective tissue in the human body for tendons, ligaments, bone, cartilage and skin. The benefits of Hydrolyzed Collagen Protein are unparalleled, and we've combined it with the Arctic Cloudberry to produce the proprietary AC2 Technology™ Blend. 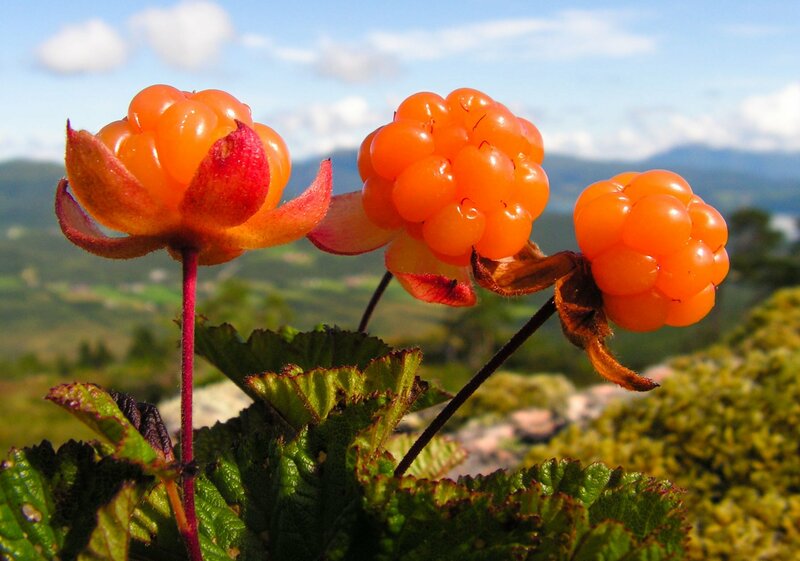 The Arctic Cloudberry, also known as Scandinavian Gold, is a natural wonder and Scandinavian people have known about its benefits for centuries, going back to the times of the Vikings who gathered it for its nutritional value. The Arctic Cloudberry grows in the pristine, untouched land of Scandinavia and is ripened under the phenomenon of the Midnight Sun, a 73-day period in the Scandinavian summer where the sun never sets. This amazing berry can't be cultivated and can only be harvested in its natural environment. †Protein absorption percentage is based on 15g of protein/hr. A. Nufínna is a nutritious smoothie mix that provides 12g of pure protein, for a powerful addition to any sensible meal. Nufínna utilizes hydrolyzed collagen protein, arctic cloudberry, and a nutrient-rich fruit and vegetable blend. Free of artificial colors and sweeteners, Nufínna gives you confidence you’re fueling yourself with the best. Q. What is AC2 Technology? A. AC2 Technology is Vísi’s propriety blend of hydrolyzed collagen protein and arctic cloudberry. This unique blend is the foundation of Nufínna’s ability to fuel your lifestyle through superior protein delivery, and antioxidant protection. Q. What does “hydrolyzed” mean? A. Hydrolyzed means the protein has been broken down naturally to make it easily digestible and highly absorbable. Even those suffering from compromised digestive systems can benefit from hydrolyzed collagen protein. Vísi’s proprietary hydrolyzation process uses all-natural enzymes to maximize protein assimilation for the highest possible quality protein you can purchase at any price. Q. What is the process to create hydrolyzed collagen protein? 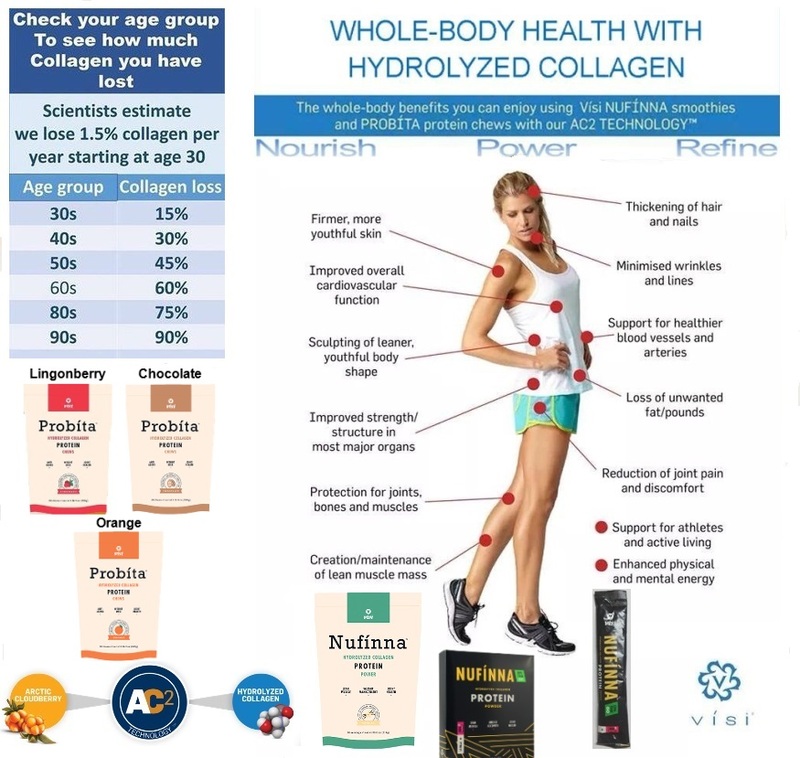 A. Vísi’s hydrolyzed collagen protein is “hydrolyzed”, meaning broken down, by a proprietary process of naturally dissolving collagen protein in water using fruit enzymes (not acid). Unlike gelatin, which is damaged by heat processing, fruit enzymes extract collagen protein without heat, chemicals, or acids. The collagen protein then goes through a multi-step process that includes micro- and nano-filtration, sterilization, and drying. This enzymatic process takes up to six hours to ensure the finest quality protein. Q. Why is hydrolyzed collagen protein better than other protein sources? A. Hydrolyzed collagen protein is the most bioavailable protein available. This means that it already occurs naturally in the human body, resulting in an amazing 95% absorption rate when consumed. Other commonly used proteins have a significantly lower absorption rates (Whey–53%, Soy–26%, Pea– 16%). Once absorbed, hydrolyzed collagen protein is immediately recognized as part of the body, which results in faster and more effective utilization of this vital building block. Q. What fruits and vegetables are contained in Nufínna? A. Nufínna features arctic cloudberry, lingonberry, strawberry, raspberry, apricot, blueberry, spinach, kelp, broccoli, alfalfa, kale, and spirulina. Q. What is the recommended time to take Nufínna? Q. What are the benefits of Nufínna? A. Protein is an essential building block of life, and Nufínna contains the most bio-available protein on the market. 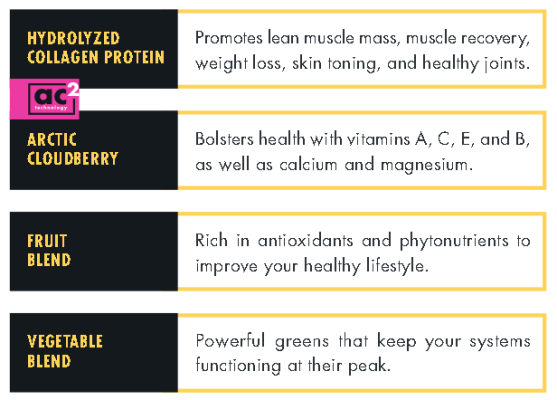 With twelve grams of hydrolyzed collagen protein—boasting a 95% absorption rate—and two grams of fiber, this delicious smoothie helps curb cravings and leaves you feeling full. Nufínna’s whole fruit and vegetable blend is a naturally nutritious snack with vitamins, minerals, and phytonutrients free of artificial colors and sweeteners. Q. How many grams of protein are in Nufínna? A. Nufínna contains 12g of hydrolyzed collagen protein. Q. How many calories are in each serving of Nufínna? A. Nufínna contains 90 calories per serving. 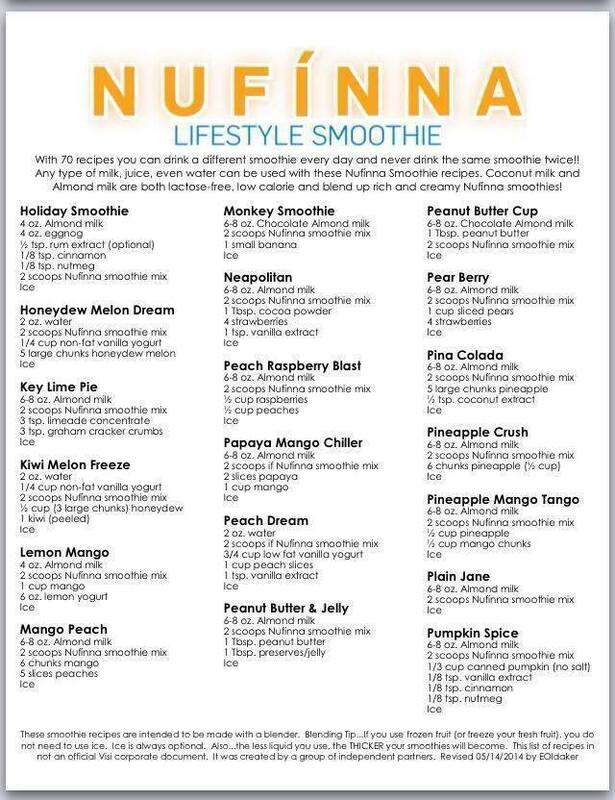 Add fruits, vegetables, nut butters, or other favorite ingredients to your Nufínna smoothie to make it your own. Q. What is the source of protein used in Nufínna? A. The collagen protein comes from a bovine source, specifically the dermis layer (hide of the cow). Q. Are the cows pasture-raised and grass-fed? A. Yes. The cows are pasture-raised and grass-fed. Q. Why use a bovine source of collagen and not a vegan source? A. Bovine collagen and human collagen are nearly identical, so the body can instantly recognize and utilize hydrolyzed collagen protein. Vegan sources are not as effective. Q. Is hydrolyzed collagen protein kosher certified? A. Hydrolyzed collagen protein is kosher certified. A. Yes. Nufínna is gluten-free. Q. Is Nufínna safe for pregnant or nursing mothers? A. Yes. Nufínna is considered a food product safe for pregnant or nursing mothers to consume. Q. Is Nufínna safe for children? A. Yes. 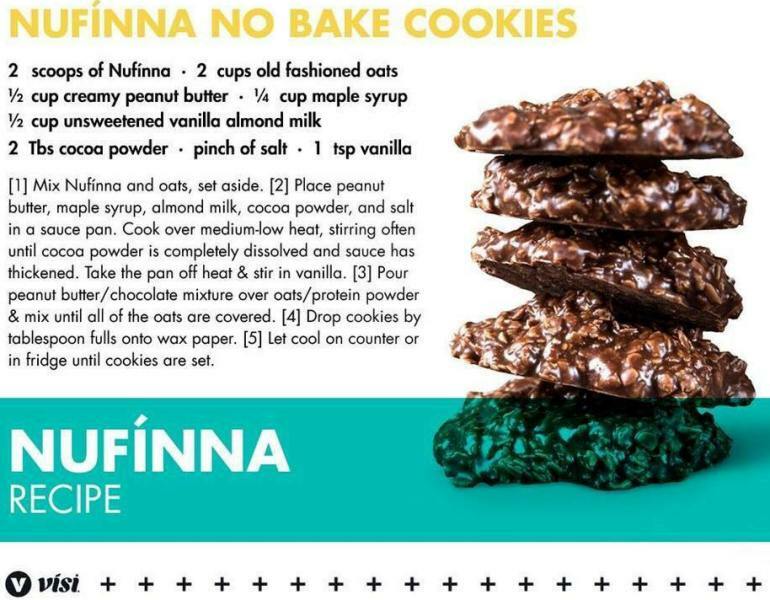 Nufínna is a great product for everyone in the family to enjoy. Q. Can I take Nufínna along with other Vísi products? A. Yes! For weight loss, taking Nufínna with Probíta and Vínnle will enhance your results. For best results use Nufínna in conjunction with a reduced calorie diet and exercise program.